You made an awesome impact for life this past year: you saved 416 babies from abortion! That’s double the lives that you saved just 10 years ago! The need for your life affirming ministry is huge: 5,711 women in Palm Beach still chose abortion last year. 5,711 little boys and girls who never had the chance at a first breath, first step, or first hug because their moms and dads didn’t find the help they needed. It is heartbreaking. It is unconscionable. It is unacceptable. We need to do something about it now. You don’t have to wait another 10 years to double the amount of lives saved—you don’t even have to wait five. I truly believe that with the proper resources and outreach strategies you will be able save 1,000 lives a year by 2020! We plan to open two new clinics this year as we work toward our goal of saving 1,000 little boys and girls from abortion each year. We absolutely need you to make this happen! Because of the awesome foundation you have laid, we can double the number of lives saved while only increasing our budget by 25%! 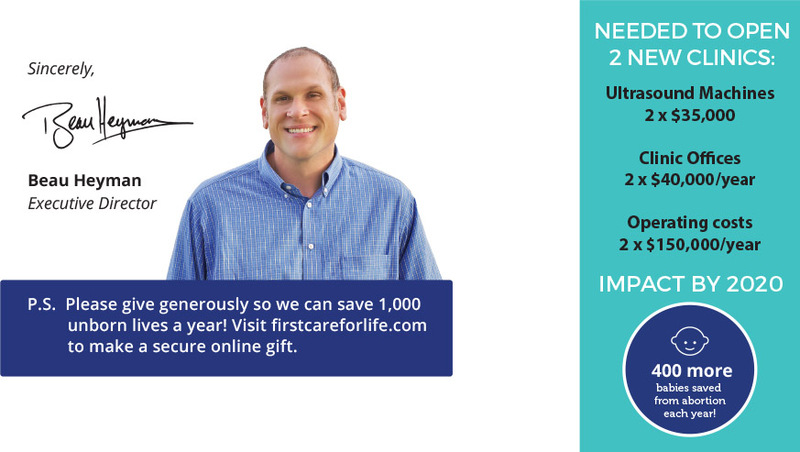 When you support First Care your gift will be well stewarded and make a tremendous difference for life, just like it did for Ricki and Raella. Something was missing in Ricki’s life and although she tried to identify it, it always seemed to elude her. Trying to fill the nagging void inside, she began to allow outside influences of extended family and friends sway her in the wrong direction. It wasn’t long before Ricki was catapulted into a lifestyle that led her into drug abuse and a life on the street. Ricki was seventeen when she met Keith. He was independent and he had his own place. This attracted Ricki. She began to spend a lot of time with Keith and eventually moved in with him. Her first child Kaiden was born when Ricki was 19 years old. Keith, who had been facing a prison sentence, was incarcerated and Ricki was left to care for her son with just $800 a month. It was during this time that Ricki became pregnant with Raella. Ricki considered having an abortion because she had no idea how she would raise her baby. Her mother hated the idea of her daughter having an abortion and encouraged her to visit First Care. After seeing the ultrasound of her baby girl, Ricki knew that she was going to be a good mom. Ricki credits baby Raella with saving her life. She is now clean and sober, living with her mother, and attending Christ Fellowship. When Ricki says that First Care is a blessing, she is saying that you are a blessing! Without you there is no First Care. Without you Ricki wouldn’t have had a place where she and her unborn baby were valued, cared for and protected. Without you Raella probably wouldn’t have been born. Without you Ricki wouldn’t have a relationship with God. Will you continue to let God use you to save women and babies from the consequences of abortion?